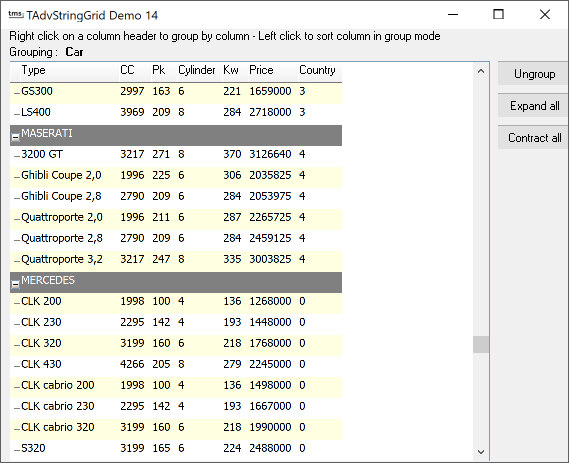 Note that the column for grouping can only start from column 1, since column 0 is the placeholder for the expand / contract nodes. The GroupColumn property has the additional benefit that it returns -1 when grouping is not active. Otherwise it returns the current grouped column. To undo the effect of grouping, the UnGroup method can be used, or as an alternative, the GroupColumn property can be set to -1. The next step, is to write the event handler to set the grouping when a column header is right clicked. Here, grouping is done by setting the GroupColumn property to the column that is clicked. Instead of doing UnGroup when grouping is active and must change to another column, the new group column number is incremented if the grouping is currently active and the current grouped column is located before the clicked column. After this check, the GroupColumn property is set when it differs from the current grouped column. The concept is simple : if a row contains a node, ie. it is a group header, then its background color is set to dark gray and the font color to white. To show vertical borders only, the OnGetCellBorder event is used while the normal gridline display is turned off by setting GridLineWidth to 0. A border is drawn at the left side of the cell if it isn't a group header and the border color is set to clSilver.